Stay 6 nights, and get the 7th night FREE! Book today for this great special! This charming ski-in/ski-out condominium sits directly at the base of lift 7. Views to the front are of the Telluride Ski Area, to the rear is the San Miguel River, and the River Trail. The private deck overlooks the Telluride Ski Area with views of expert runs, Milk Run and Coonskin. This condo is adjacent to the Telluride Valley Floor. The newly acquired Valley Floor offers several kilometers of groomed trails for both skate and classic nordic skiing. There is a king-sized bed in the master suite, a queen in the second bedroom, and a queen sofa sleeper in the living room. The kitchen is fully equiped, and offers all the comforts of home. The condo has a broadband internet connection, and a laptop for your convenience. WI-FI is available. After you arrive, leave your car in the heated garage and forget about it. Take an easy stroll to the wonderful shops, restaurants, and bars of Telluride. If you prefer riding over walking, the FREE Galloping Goose shuttle stop is right outside. It circles town about every 10-20 minutes with stops at the Gondola and along Main St.
After a hard day of skiing, leave your skis in the private ski locker and refresh your body in Cimarron's brand new outdoor hot tubs! 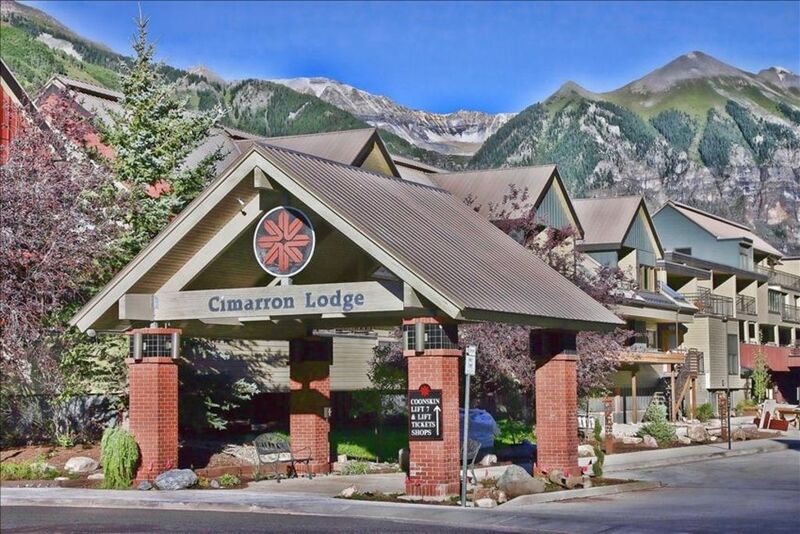 Ski rental, lift passes, and equipment sales are available in the Cimarron Lodge complex. Minimum 3 Night Rental! When you call ask us about our 7th night FREE Special. We love to spend time in Telluride. Favorite Ski Town, no crowds, amazing scenery, ski lift and lockers, San Miguel River frontage. Quick access to Lift, and and location on San Miguel River. Valley Floor for Nordic Skiing. This condo sits at the Lift 7 base. Views of expert runs Coonskin, and Milkrun! This property backs up to the San Miguel River, and River Trail. This river flows year round. Great ski condo with views and super short walk to Coonskin Lift. Had a small issue with parking access to garage but owners were quick to respond and helpful. Right at the base of the Coonskin Lift. Well stocked. Perfect for 2 couples. Walking distance to downtown Telluride. The condo was very clean and information left for us on how to work the condo was excellent. Great location to the lift, and the hot tub was very close. Easy walking to anywhere you want. No car needed. Had no issues. It was good for our activities. It was very easy to catch the galloping goose. Great restaurants. The room in the first floor can be updated a little or improved in the sense that drawers in the chest were loose, like no rails. I wish we had dishwasher soap tissues and trash bags. But other than that great place. We are glad that you enjoyed your stay and apologize for the depleted supplies. We hope to hear from you in the future.